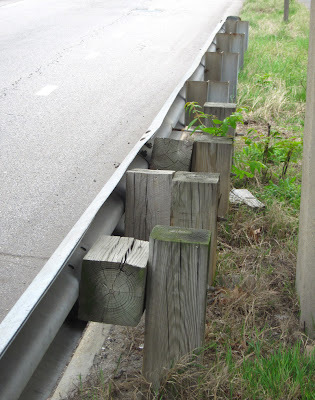 Most metal highway guardrails have metal posts. Metal guardrail posts are common along Rt. 50. But some rare wooden posts support the guardrail along Rt. 50 in Rosslyn just west of the Westmoreland Pedestrian Overpass. Wooden guardrail posts look more natural and organic. They probably are more environmentally sustainable. Rosslyn's rare wooden posts are some consolation for all the metal added to Hillside Park in its recent renovation. Wooden posts have several advantages over steel posts, including the fact that the wood acts as a shock absorber. Furthermore, an iron mine leaves the earth scarred forever while harvesting trees leaves land that can be replanted to grow more trees which will absorb carbon dioxide as they grow. Finally, I note that the forests in our great Northwest have lots of trees waiting to be harvested to make posts for guard rails and at the same time provide jobs for unemployed lumberjacks. Great points. We need to form a broad-based collation of progressive organizations to advocate for wooden posts. wow, yeah, just think how much shock an old-growth guardrail post would absorb. Old-growth trees should not be made into guardrail posts! Use only sustainably grown trees!